The maximum safe speed for a residential area. The maximum safe speed for a work zone. 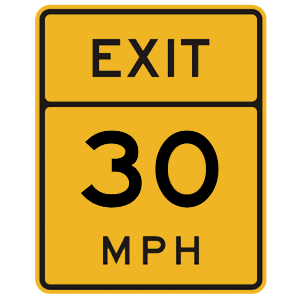 This advisory speed sign indicates the maximum safe speed for a highway exit (in this example, 30 mph). The increased stopping distance required by large vehicles. The decreased stopping distance required by large vehicles. The decreased noise of larger vehicles. The increased speed of larger vehicles. When driving near heavy trucks, other drivers and highway users must make allowances for the increased stopping distance required by the large vehicles. Drivers of smaller vehicles should remain in locations where they can be seen by the driver of the large vehicle and where their view of traffic is not blocked by the vehicle.